The Grand Palace is one of those sights that is so visually spectacular that even if you nothing about its history and purpose, it can’t fail to impress. A little bit of reading makes the Palace complex really come alive, however. (I recommend William Warren’s Bangkok for a fascinating, candid history of the city and the Grand Palace’s origins). 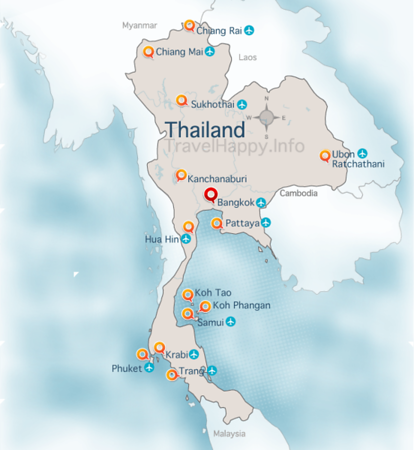 Built in 1782 to establish Bangkok as the new capital of Thailand, much of the compound recreates the most important buildings from the previous capital city Ayuttaya, which was invaded and overrun by the Burmese and caused the Thai monarchy to relocate to Bangkok. 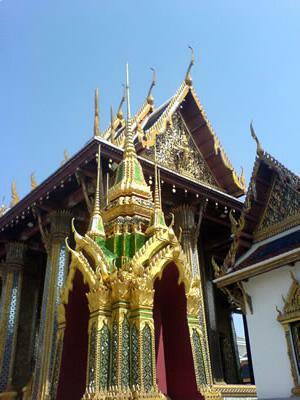 Wat Phra Kaeo is the name given to any temple in which the Emerald Buddha has been housed – you’ll find temples with the same name all over Thailand. 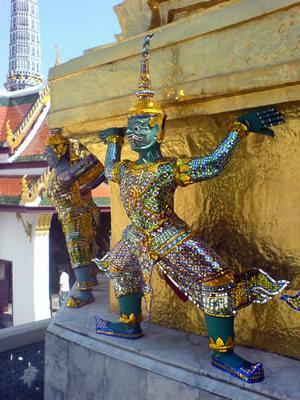 The Emerald Buddha was discovered in 1434 – six centuries ago! – and originally swathed in plaster, so that it was considered to be an ordinary Buddha statue. Legend has it that the plaster on the Emerald Buddha’s nose flaked off and the Abbot who discovered it thought that the green stone revealed beneath was emerald. The Emerald Buddha is actually made of jade, but its auspicious discovery meant that it became Thailand’s holiest Buddha image – so much that the Emerald Buddha was the cause of a war between Thailand and Laos in 1778. On the Upper Terrace overlooking Wat Phra Kaeo are several more beautiful buildings, including the huge golden chedi and a complete scale model of Angkor Wat, the world’s biggest religious building. While Angkor resides in modern day Cambodia, the original Angkor empire included much of Cambodia and Thailand, and Angkor remains an important holy site to many Thais too. The Palace is so big and has so much to look at that it’s worth coming back a couple of times – and if you come early in the morning, you may well be able to enjoy it when they’re are less people around. Even at its most popular, though, Bangkok’s Grand Palace is definitely a place to experience when you’re visiting Thailand’s capital city. On a practical note, the Grand Palace is only a couple minutes walk away from Wat Po, another must-see Bangkok attraction – it’s worth doing both together. Wat Po is almost as spectacular as the Grand Palace with its huge Reclining Buddha and feels less formal too. Note that in both places you should wear modest clothes to show respect – close-toed shoes, trousers, long skirts and tops that cover the shoulder.